Love, love this Chicken Milanese recipe from Fine Cooking Magazine. Not only is is super easy to make, it’s a meal all-in-one! Matt, who’s not a big salad eater actually likes this and finishes his plate, including the salad portion! 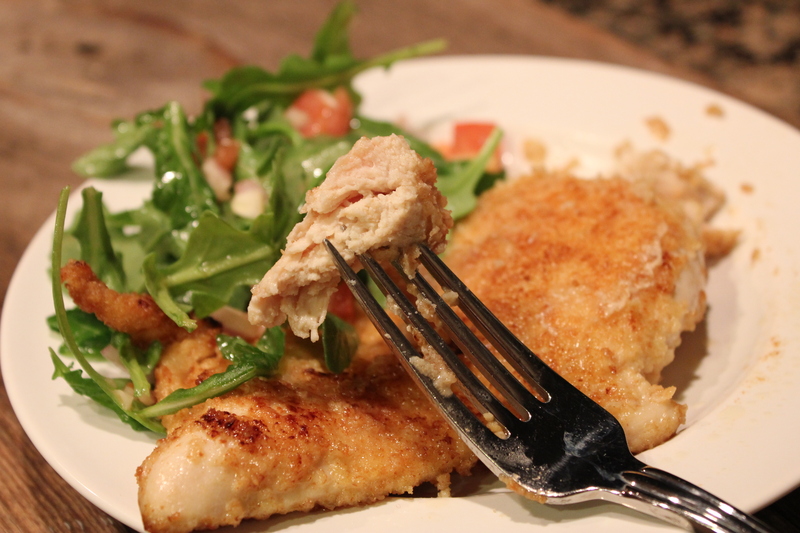 The depth of flavor is outstanding from the red wine, dijon mustard vinaigrette accompanied by the nutty arugula, fresh tomatoes, and savory breaded chicken. 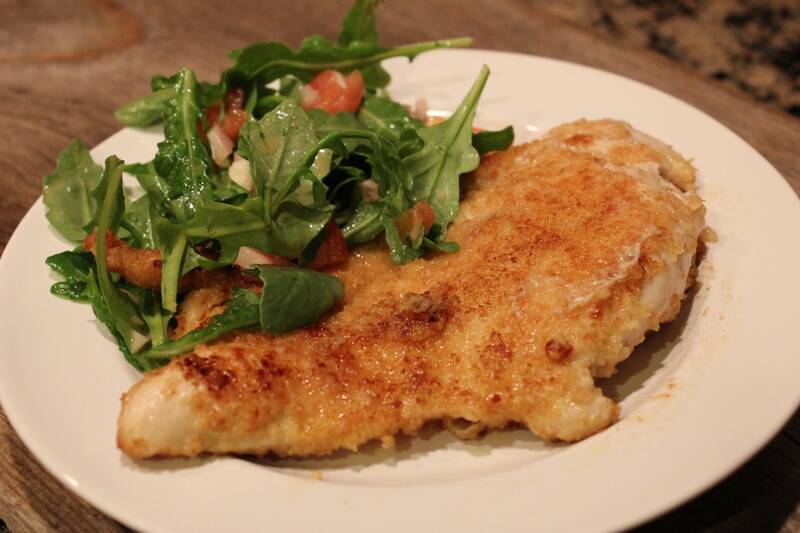 My mom found this Chicken Milanese recipe from the “Fine Cooking” magazine, “The Best of Chicken 2010 Issue”, and I would definitely consider it one of the best chicken recipes out there! This dish is super simple but it feels like you’re eating at a 5-star restaurant. It is elegant, delicious, and a crowd pleaser. Enjoy, you will love it!!! Whisk olive oil, red wine, shallots, dijon mustard and garlic. Saute chicken in butter and olive oil, until golden brown and done. 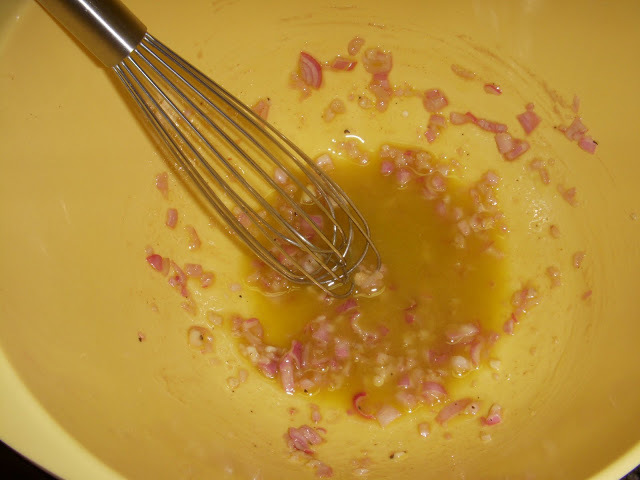 In a large bowl whisk the shallot, vinegar, mustard, garlic paste, and a large pinch of pepper. Add 2 tablespoons of the olive oil in a slow, stead stream, whisking constantly, until the dressing emulsifies. 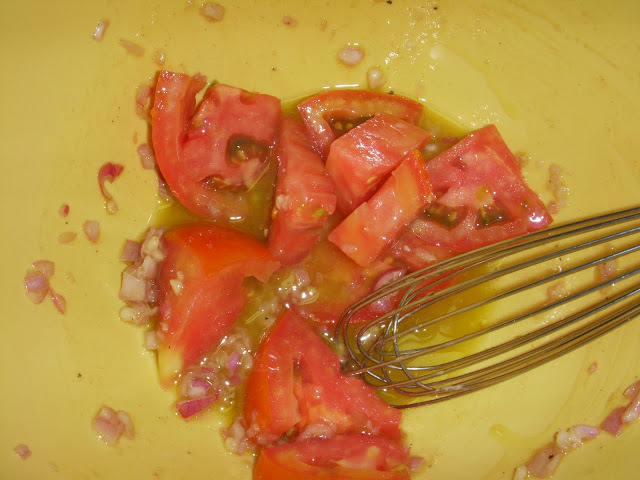 Add the tomatoes to the vinaigrette and set aside until ready to serve, up to 2 hours. Mix ¼ teaspoon each salt and pepper in a small cup. Pound the chicken to ⅜ thick between two sheets of wax paper. Season with some of the salt and pepper. Beat the egg in a wide shallow bowl until smooth. Spread the breadcrumbs on a plate. 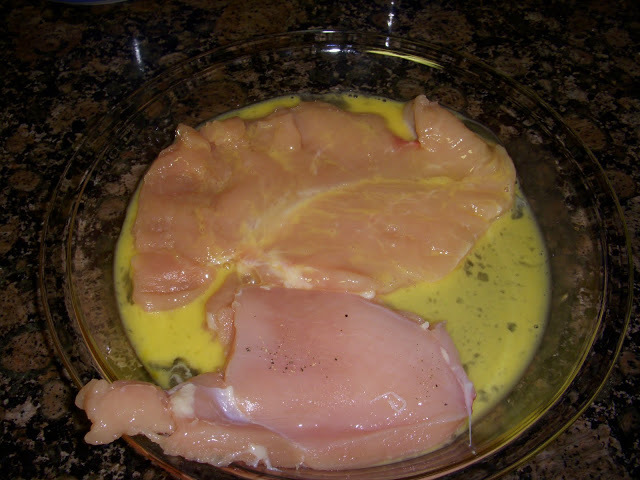 Dip a chicken breast into the egg, coating thoroughly and shaking off any excess. Then dip it into the breadcrumbs, patting on the crumbs so both sides are well coated and shaking off any excess. 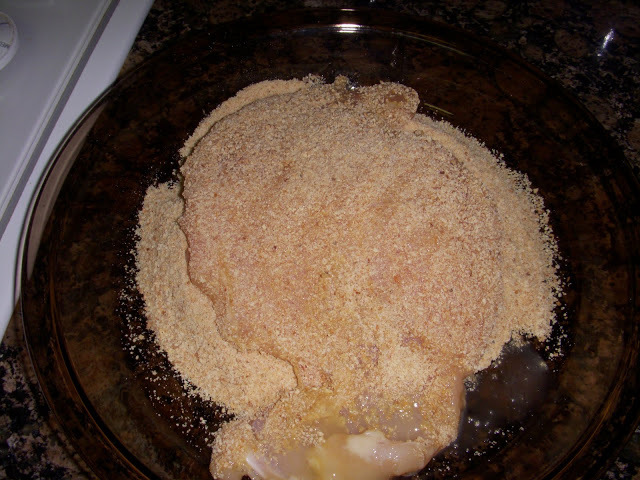 Lay the breaded breast on a sheet of wax paper. Repeat with the other chicken breast. Heat the butter and the remaining 2 teaspoons olive oil in a large (12-inch), heavy skillet over medium-high heat. When the oil is hot enough to sizzle a breadcrumb, add the chicken breasts, keeping them separated. Cook, shaking the pan occasionally, until golden brown, about 2 minutes. Season each breast with some of the salt and pepper, gently turn over with tongs, taking care to keep the golden crust intact, and cook until the second side is golden brown, 1 to 2 minutes. Watch carefully and don't let the crumbs get too dark. Season with salt and pepper and drain for just a moment on paper towels. 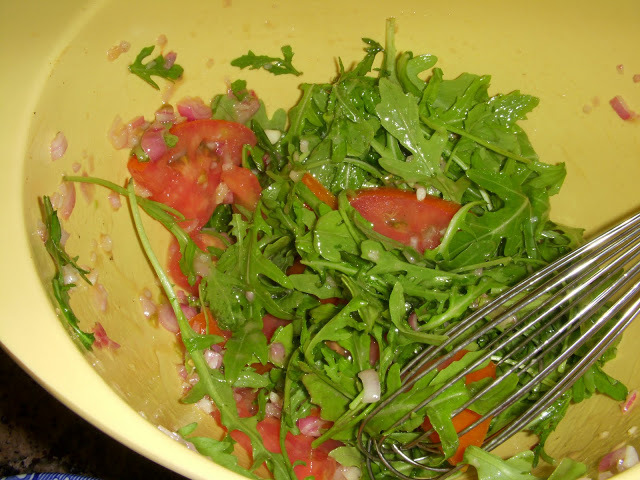 To serve, add the arugula to the vinaigrette and tomatoes and toss. Arrange the sauteed chicken on warm serving plates and top each with a tall pile of the salad. 3 Responses to "Chicken Milanese"
It is delicious!! I give it 5 stars! 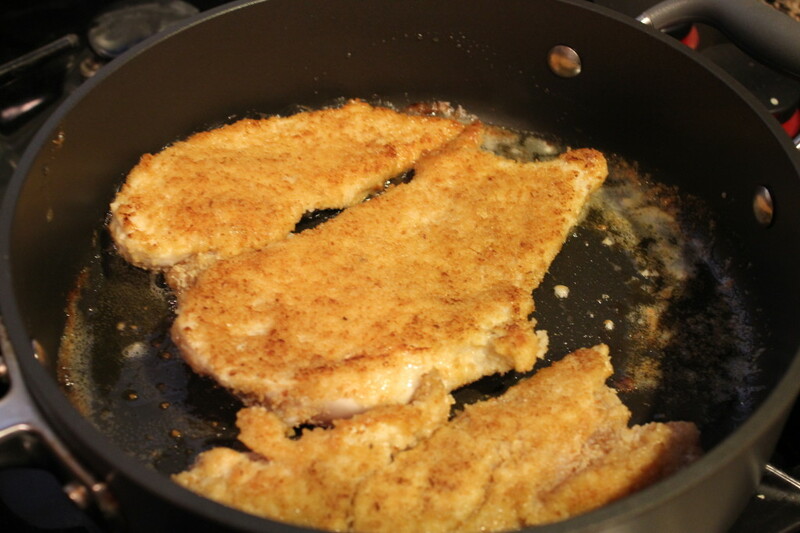 Chicken milanesa is a long time family favorite. Gabe, my hubby, his mom made it for him when he was a child. It’s now my kids favorite dinner. I love the arugula salad too. I won’t make this without it! It has such flavor takes the dish up a notch!